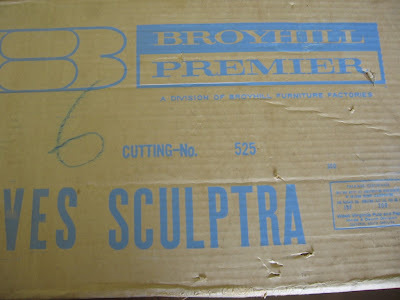 In case you missed it, Retro Renovation recently tracked down some of the original Broyhill Brasilia and Broyhill Sculptra catalogs. If you're a fan of either collection, you should check it out. They have the only image of a Sculptra cigarette table that I've ever seen, other than the drawing in the Broyhill Sculptra brochure. And in other vintage Broyhill furniture news, this little gem of an image popped up on craigslist. It might just look like a boring brown box and it is, but it a boring brown Broyhill Premier Sculptra box. It's the only one I've ever seen. Probably because most people don't keep furniture boxes for over half a century. That's wild! Where could someone have kept a box for that many years without it getting wet or faded or mice getting to it? It looks practically new. I know. It's almost like they kept the box in a box. I'd be surprised if Broyhill themselves had a Sculptra box in this nice of condition.